Your Will enables you to provide for your family, friends, loved ones and, any cause you support. Your Will can ensure the future financial wellbeing of your family and other people you wish to benefit. 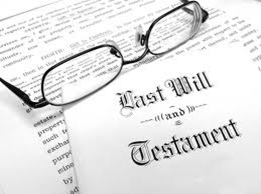 A bequest is a gift of assets (money and/or other property or valuables) that is made through your Will, Living Trust or other testamentary arrangement. Monetary bequests are usually given by you specifying an amount or a percentage of your estate. No funds are transmitted or irrevocably transferred to your designated charity until after your death. You can help the Parish with a bequest in your Will. A bequest to your Parish can create lasting change in people’s lives. Remembering your Parish in your Will assists the Church to continue to make positive changes to people’s lives every day. You can help make a difference. More than 50% of Australian have no valid estate plan at their death. Please consider creating at least a simple will to ensure your wishes are carried out after your death. If you have not created an estate plan at the time of your death, the state of South Australia has a plan which will distribute your assets. This probably is not the way you would wish your hard-earned assets to be distributed, so contact an Estate Planner or a Lawyer who specialises in estate planning and ensure your wishes are fulfilled. And please remember St. Francis of Assisi Parish in your will. This sends a strong message that the Church played an important role in your life, while guaranteeing that the Church will continue to be helped long after you’re gone. This generous act provides important assistance to the Church and may even prove to be a tax benefit to your heirs. Talk to your lawyer about how best to remember the parish in your will. Specific Bequest – Designate cash or assets to St Francis of Assisi Parish, Newton. Residual Bequest – Plan for St Francis of Assisi Parish, Newton to receive all or a portion of your estate after other specific bequests have been distributed. Percentage Bequest – Designate a certain percentage of the estate to go to Plan for St Francis of Assisi Parish, Newton. Contingent Bequest – Make St Francis of Assisi Parish, Newton the recipient of a bequest if others named in your will are not living at the time of your death.